To celebrate Star Wars Day (the fourth of May) EA is giving everyone four hours of Star Wars Battlefront on PC for free. Isn’t space excellent? Get more space with the best space games on PC. That’s as much as you want! (For four hours). For free! (For four hours). You’ll be able to do anything the full version of the game can do, but not the DLC, and given you only have 240 minutes, you’ll be hard pressed to get much unlocked. You can start pre-loading on Origin to make the most of the window, and from 11am PDT on May 4 you can fight your way through one of the better Star Wars games still available (RIP Galaxies). For those who already own the game, logging in during this most honoured of days will net you 4,444 credits. 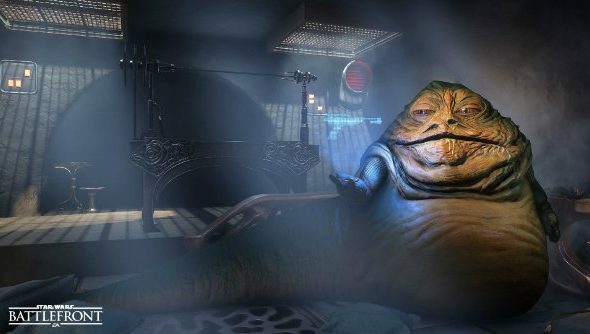 Battlefront isn’t the only Star Wars game EA are using to celebrate a day named after the fictional appropriation of a traditional catholic faith service greeting, as The Old Republic and Galaxy of Heroes will also hold events. The Old Republic will be granting double xp and requisitions all week and you can play the Knight of the Fallen Empire DLC for free until May 30. Also, logging in any time between now and May 4 will grant you theM4-I6 Zakuulan Astromech Droid mini-pet. It’s like R2-D2 but not as sassy.